Last week, Samsung released an update for the Gear S2 smartwatch and now owners of the watch are treated to another one. 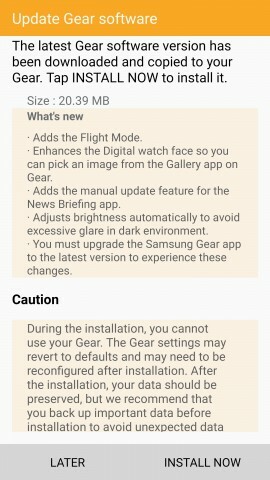 The latest update weighs in at 20.39 MB and is available from the Samsung Gear app. Sadly, the company didn’t update the changelog of the latest update and you can find the same bullet points from the one from a week earlier. We can only guess what changes the new update brings, but it’s safe to assume that some bugs needed ironing out and there are no new features this time. The size of the update also points in that direction with the new release costing just over 20MB, while the previous one exceeded 80MB. Still if you notice anything make sure to drop us a line in the comments.